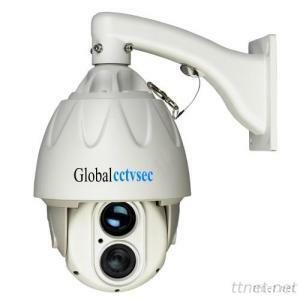 It is a high-definition outdoor use high-speed dome network camera, cmos video sensor and a high-performance network video processing chip for 1080p (1920×1080) HD resolution video images.the cameras built-in HD zoom camera module, can be 20x optical zoom function,built-in high-speed cloud can achieve vertical and horizontal high-speed rotation. High strength double aluminum alloy cover, with thermal insulation. Built-in zoom infrared light, infrared light or laser light is adjustable, completely solve the night without lighting fast capture target . 1 programmable line scan trajectory and a set of automatic line scan trajectory, the maximum level speed of 200 ° / sec. Built-in temperature control system, make sure the ball machine at a constant temperature range, improved product reliability and service life .